İstanbul will, hopefully, have a new airport in 2019, replacing the current Atatürk Airport that has reached the limits of its capacity. But do not worry. The new airport will have enough space, maybe more than necessary. Indeed, for its opening an annual capacity of 90 million passengers is projected, whereas İstanbul Atatürk Airport handled 45 million passengers last year. Then, there are plans to increase the capacity of the new airport to 120 million and even 150 million in a third stage. If these ambitious plans are realized, the new airport will probably be the biggest in the world. Istanbul mega airport: Too big or not? This very ambitious project raised, as expected, a heated debate in the Turkish media regarding environmental concerns and profitability, all the more after Prime Minister Recep Tayyip Erdoğan, a great lover of mega projects, presented it as one of the most important endeavors of Turkey under the Justice and Development Party (AK Party) rule in terms of capacity and tender price. 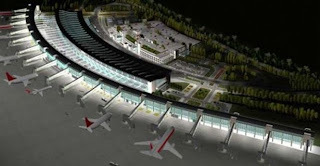 Indeed, a few weeks ago the new airport was awarded to a consortium of Turkish firms under a build-operate-transfer (BOT) system for 22 billion euros to be paid to the Turkish Treasury over 25 years. On Friday, the Bahçeşehir University Center for Economic and Social Research (Betam) published a research brief which I co-authored which might help in seeing things more clearly in this hot debate. Betam's research tries to answer two questions: Are the projected capacities realistic and could the new airport be profitable, taking into consideration the high tender price? Before going through the airport mathematics, let me give you Betam's answers: If the Turkish economy grows around its potential in the next 25 years, the projected capacities do not seem to be the product of a megalomaniac mindset. But if growth rates lag a little behind potential growth, even the 120 million passengers target is seen as too optimistic. The answer to the second question is, in fact, included in the first answer. If the passenger forecasts are not realized, the estimated operating profits will be far from compensating the rent to be paid to the Treasury together with the installments of the bank loan. Thus, the critical point is economic growth. Betam forecasted passenger increases based on the results of a slowdown taking into consideration population increase, the rate of economic growth and ticket prices, the first two parameters being the most influential. Population increase is easy to forecast. To estimate the growth rate Betam considered two growth scenarios. In the first one, it set growth at 5 percent for the next seven years, which is the admitted potential growth rate for the Turkish economy, then 4 percent until 2030, and, finally, 2 percent up until 2043. In the second scenario, should Turkey be unable to implement the necessary reforms in order to secure its potential economic growth, the growth rates used in the forecasts are 4 percent, 3 percent and 1.5 percent, respectively. In the first scenario, a 90 million capacity in the first stage seems more than reasonable and 150 million passengers would be achieved around 2030. However, if the Turkish economy continues to be trapped in a low growth regime -- and it seems to be the case actually -- the slightly lower growth rates would have a decisively adverse impact on the number of passengers. Indeed, in the second scenario the forecasted number of passengers hardly reaches 70 million in 2019 and a capacity of 120 million would be fully utilized only in the 2040s. Let me underline once again that the necessity of a mega airport for Istanbul depends crucially on the future growth performance of the Turkish economy. The profitability issue is, quite logically, linked to the number of passengers and flights, given the agreed service prices in the tender. Taking as benchmarks the financial information of Hartsfield-Jackson Atlanta International Airport, the busiest in the US with about 90 million passengers, as well as those of the Atatürk and Sabiha Gökçen airports, Betam's estimates show that in the optimistic scenario, cumulative losses appear until 2030 because of rent and loan installments. But these losses are largely compensated for after this thanks to large profits. Nevertheless, in the second scenario, the profitability of the mega airport might be very problematic unless the consortium succeeds in raising enough non-operational revenue from real estate developments in the extensive area (7,400 hectares) provided to the new airport. Is the Turkish economy on the eve of a recession? Will Gezi Park protest be a turning point?